1. Combine the egg, cayenne, mustard, salt, vinegar, stevia, whey and 1/4 c. oil in the container of a blender or food processor. 2. With the machine running, add the remaining oil in a thin, constant, steady stream. 3. After you've added about half the oil, the mixture should start to thicken. 4. Once all the oil has been incorporated, shut off the machine and transfer mayonnaise to a small Mason jar and close the lid tightly. 5. 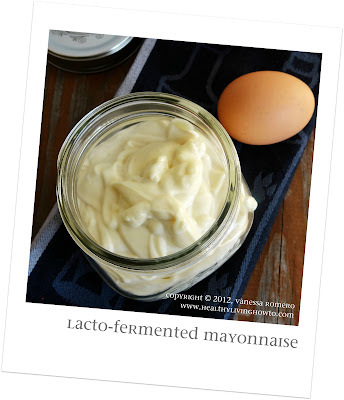 Leave the mayo on the counter for 7-12 hours to "ferment" and then refrigerate. All ingredients should be at room temperature. Assuming the only ingredients you keep in your refrigerator are the egg and whey, simply take them out a few hours before you plan to make the mayo. I use coconut vinegar in this recipe for it has amazing health benefits, however, you can certainly use another vinegar. Some recipes call for lemon juice, and I am finding I prefer mayo without it. Personal preference. You can use all olive oil if that's your thing, but be sure to use an olive oil you like the taste of. To be perfectly honest, I am not a huge fan of olive oil and will use light olive oil, even though it's refined. Finally, you don't have to lacto-ferment this mayonnaise. It will be still be much healthier then store bought mayo. However, it will only last for about a week in the refrigerator. On the other hand, lacto-fermented mayo will last about 6-8 weeks or longer, don't worry it will be long gone before it goes bad.